Ok. I have a lot to say so bear with me. First off, the pumpkin scones with clotted cream and jam are like bits of brown-sugar topped heavenly goodness. My 5 stars are purely for these scones. I think if I ever move out of the city I will really miss them. 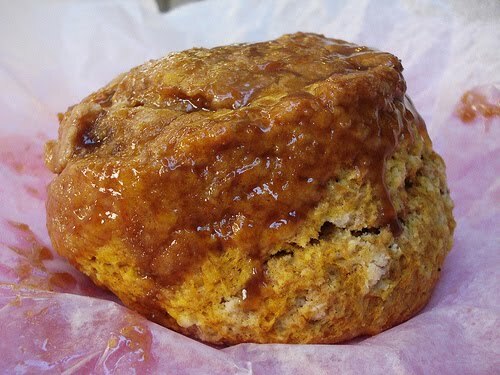 I go for tea and scones frequently…and have gotten lots of other (even non-pumpkin-loving) people hooked on them too. I’ve tried the other flavors- and keep coming back to the pumpkin. Dare I say, the best scones in the city. Wow. Said it. If you want to stay there, it’s a lovely experience- especially good for the girlie girls in your life. The antique-y looking mismatched tea pots and cups/saucers make it a special snack. It can get a little confusing looking at the vast tea menu, but the staff are knowledgable and always make good recommendations. Other than tea and scones, the food is kinda overpriced for what it is..but it is good. The mad hatter is an awesome presentation, and it’s one of my favorite meals to share to catch up with a friend. They also sell some very cute stuff. I have an umbrella from there that I love so much that when it broke, I went back to buy another one. One plus (or minus)depending on how you look at it, and what kind of mood you’re in, it can get a little mommy + me-centric. I personally find little girls in dresses drinking tea adorable, but I know some people who would find this less than pleasing as a backdrop to their afternoon tea.